I don’t know if I mentioned this, but I pretty much ate my weight in cheese over the holiday. Now that I feel sufficiently icky, I’m trying to focus on some more plant-based recipes to help me get back to feeling normal. 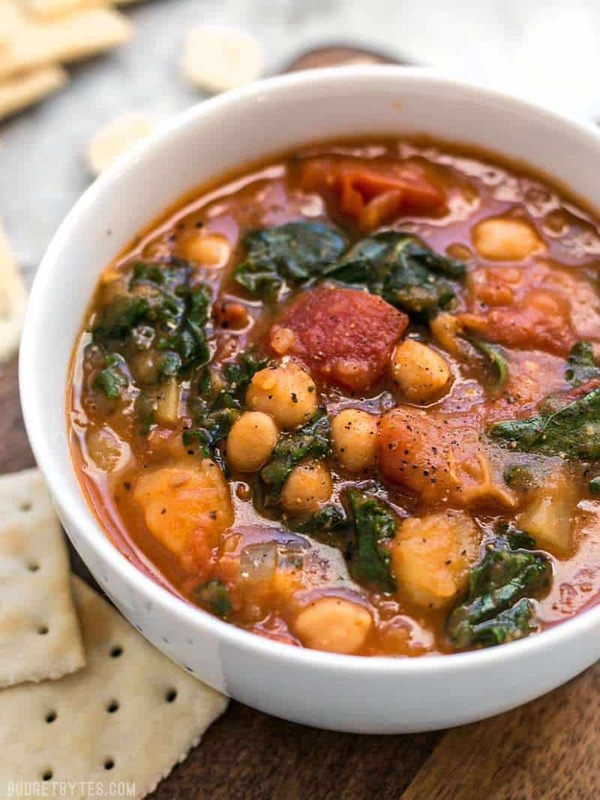 I decided to throw together a warm stew today with some things that I had on hand and ended up with this super hearty and delicious Smoky Potato Chickpea Stew. NOM NOM! Perfect for these cool fall days! 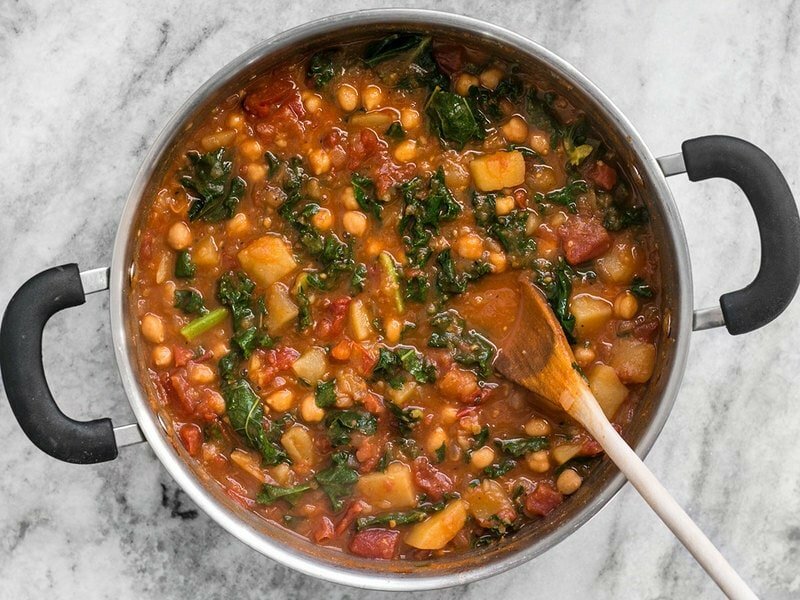 Want more vegan stews? 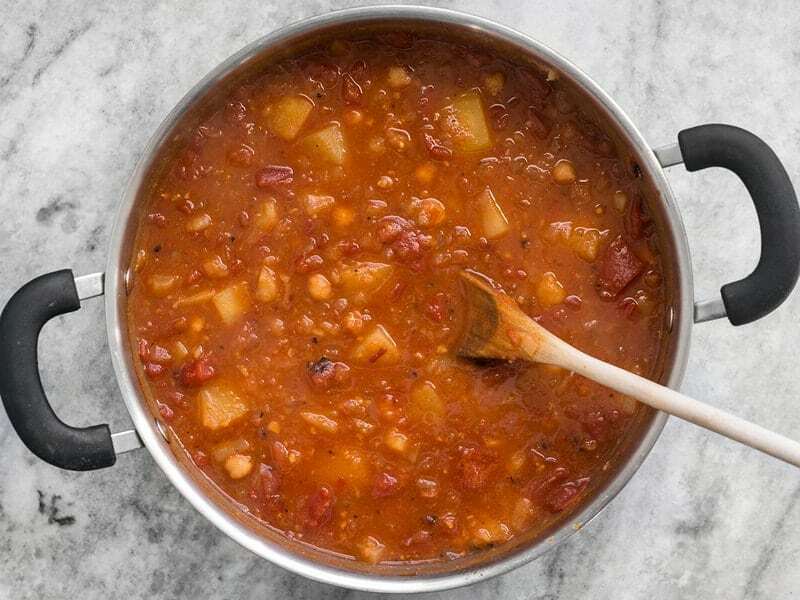 Try Vegan Winter Lentil Stew, Moroccan Lentil and Vegetable Stew, or West African Peanut Stew. The seasoning for this stew is very simple, just a ton of smoked paprika and curry powder, plus a little pinch of red pepper flakes for kick. I simmered the soup for a good long time which made the potatoes break down and thicken the broth into a wonderfully thick stew. I was really bummed that I didn’t have a really good loaf of bread to scoop up this stew, but I found some saltine crackers in my pantry, which worked in a pinch. Just know that this stew is just begging for a nice piece of crusty bread to go along with it! 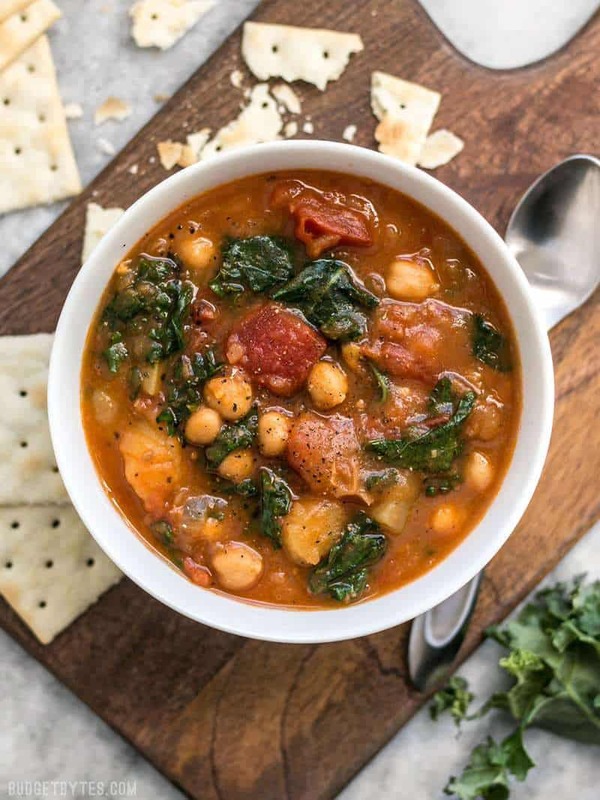 This Smoky Potato Chickpea Stew is a hearty and filling plant-based dish that will keep you full and warm this winter! Finely dice the onion, mince the garlic, and grate the ginger. Add the onion, garlic, and ginger to a large soup pot with the olive oil and sauté over medium heat until the onions are soft and transparent. Add the curry powder, smoked paprika, and red pepper flakes to the pot and continue to stir and cook for 1-2 minutes more to toast the spices. While the onion, garlic, and ginger are sautéing, peel the potatoes and cut them into 1-inch cubes. Drain the chickpeas. 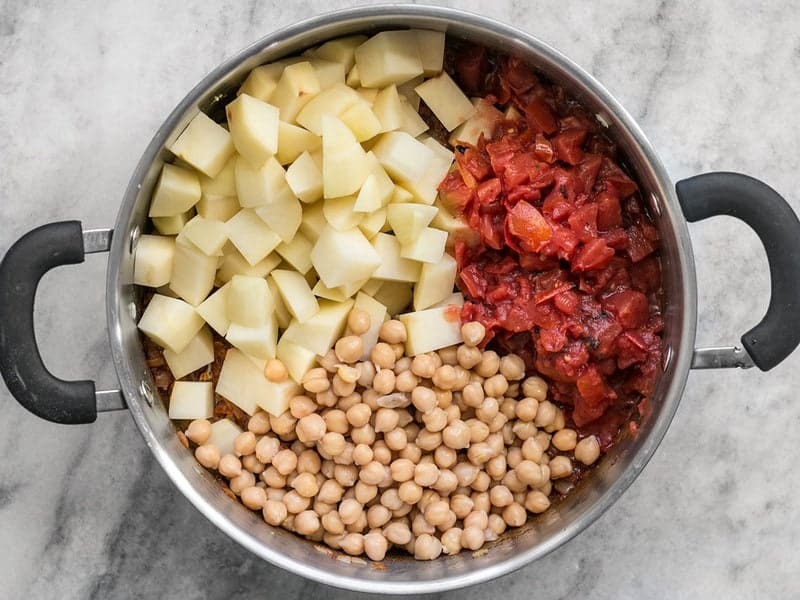 Once the spices are toasted, add the potatoes, fire roasted diced tomatoes (with juices), and chickpeas to the pot. Pour the vegetable broth over top, then stir until everything is combined. Place a lid on the pot, turn the heat up to medium-high, and allow it to come to a boil. Once boiling, turn the heat down to low and allow the soup to simmer with the lid in place for 45 minutes, stirring occasionally. After 45 minutes, stir the stew well and smash the potatoes against the side of the pot to help them break down and thicken the stew. Add the chopped kale and stir it into the stew until it has wilted. Taste the soup and adjust the salt or other spices if desired. Serve hot with crusty bread or crackers. *I use Better Than Bouillon to make my broth. Finely dice one onion, mince two cloves of garlic, and grate about a teaspoon of fresh ginger. 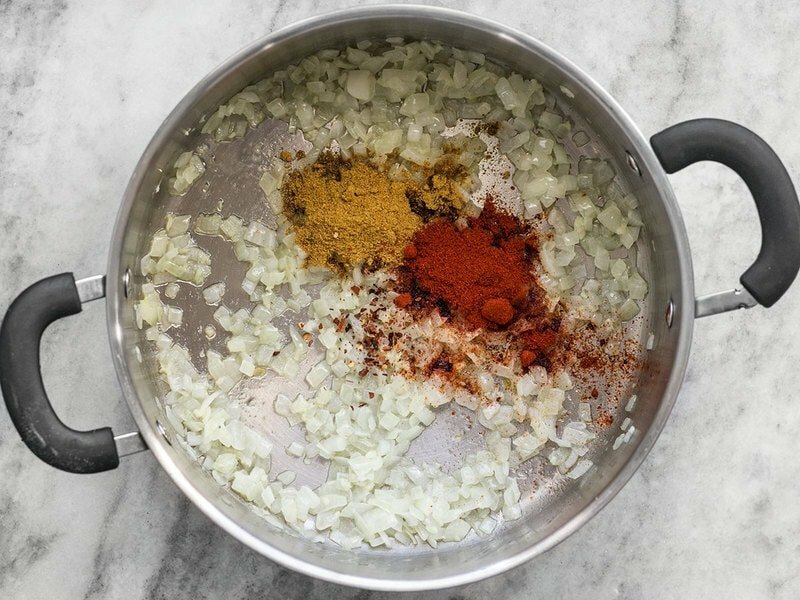 Add the onion, garlic, and ginger to a large soup pot along with 2 Tbsp olive oil and sauté over medium heat until the onions are soft and transparent, then add 1 Tbsp curry powder, 1 Tbsp smoked paprika, and a pinch of red pepper flakes. Continue to sauté for 1-2 minutes more to toast the spices. While the onions garlic and ginger are sautéing, peel and dice two russet potatoes and drain one 15oz. can of chickpeas. Once the spices have toasted, add the potatoes, chickpeas, and a 15oz. can of fire roasted diced tomatoes (with juices) to the pot. Pour 4 cups vegetable broth over the contents of the pot, stir everything really well, then place a lid on top an turn the heat on to medium-high. Allow the stew to come up to a boil. Once it reaches a boil, turn the heat down to low and let it simmer for 45 minutes, stirring only occasionally. After 45 minutes, stir well and smash the potatoes against the side wall of the pot to help thicken the stew (the photo is after smashing). 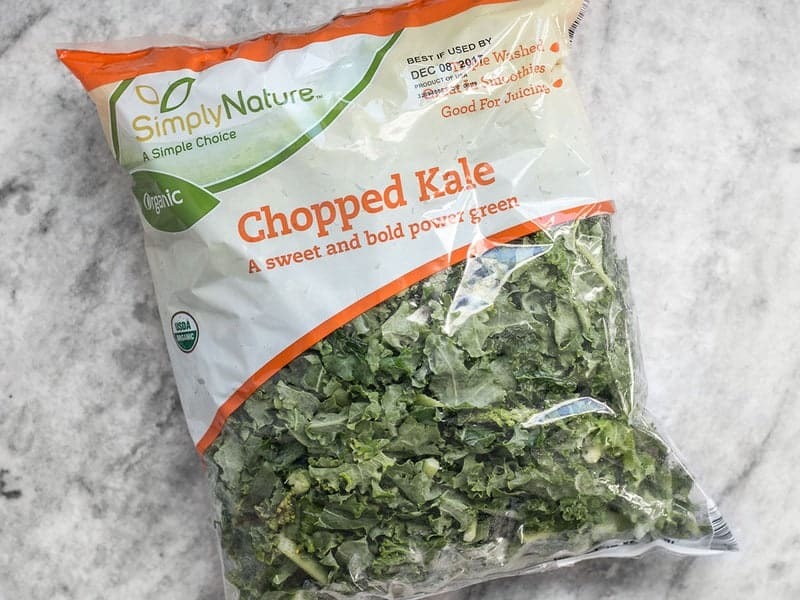 Pre-bagged chopped kale is the best thing that ever happened to me (okay, maybe that’s an exaggeration). I used about 1/3 of this 12oz. bag. You can use however much you want. Just add a few handfuls to the stew and stir it in until the kale is wilted. If you like your kale extra tender, you can simmer it a bit longer to soften it up, but I like mine to have some tooth and to be bright green. It’s important to taste the stew at this point and adjust the salt and seasonings to your liking. Depending on what type of broth you used, you may want to add a touch more salt to really make the flavors pop. Or maybe you want just a little more heat, so you add another pinch of red pepper flakes. Yes, this one should freeze well. Fabulous!!! Thank you! Even my picky husband loved it. Great tasting stew, however, how many calories are in a serving,. it would help me while maintaining my daily points in Weightwatchers. I was wondering the same thing, just now. This is the second time I’ve made this soup in two weeks! It also had more than 900mg of sodium because I assumed canned beans, tomatoes, and broth. If that’s a concern you can bring that down to about 250mg by using low sodium varieties. Plus there are all those lovely vegetables, which give it about 900mg of potassium. Thank you for that. I did purchase low sodium ingredients based on your input. I’m trying it tonight! Any recommendations for substituting collards in for the kale? They were all out of kale in my local store and I don’t like how wilty spinach gets in soups. Collards should work the same as kale. :) Just stir it in and let it simmer until the collards are tender to your liking. Delicious! 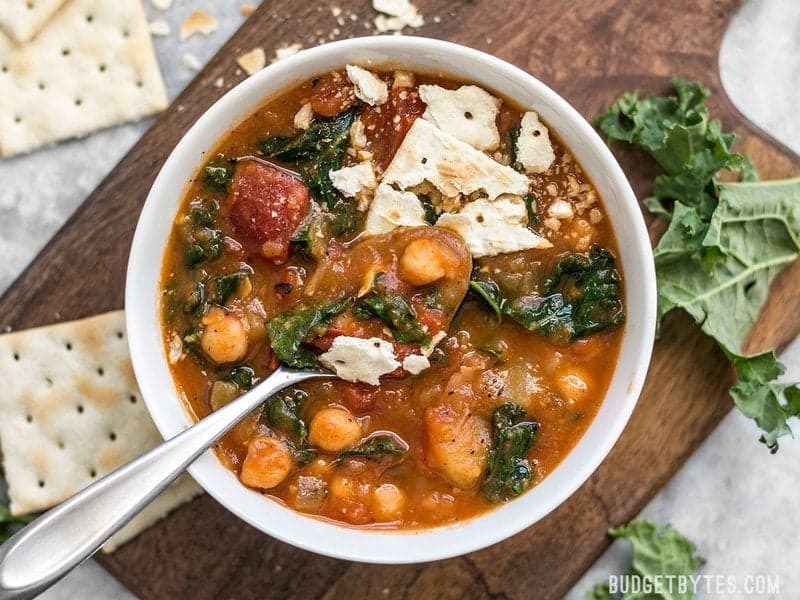 I’ve been trying to find a chickpea recipe I really like in the slow cooler and I’ve had no luck until THIS masterpiece! I cooked on high for 4 hours and the extra liquid cooked off leaving it less soupy, less stew-like. We served it over top of quinoa. Delish, will definitely make again! Delicious! Thanks for a great vegan recipe! I would suggest a little splash of lemon juice to brighten up the flavor. It was pretty okay originally, but once I added the lemon juice, I liked the leftovers a lot better. I made this to prep for lunches this week and… wow. I made some substitutions based on what I had around the house, but this recipe made with sweet potatoes and spinach (rather than white potato and kale) is the bomb. 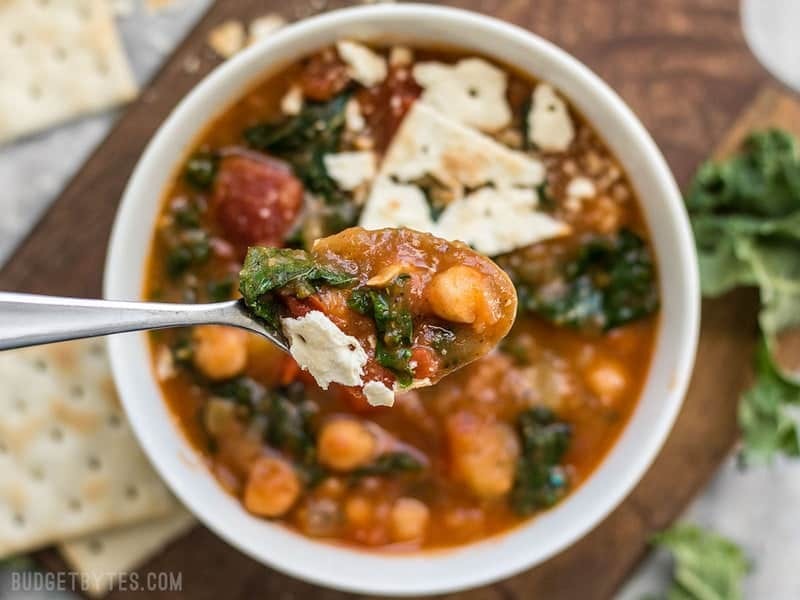 Full of nutrients, low fat, flavorful, spicy, sweet, and incredible easy to make. Another winner, Beth!! I have made this recipe several times and my family and friends love it. I have used both frozen and fresh greens, different kinds of curry powders, and today I’ve added lentils to the pot. It always comes out delicious. Can i make this a day or two ahead of serving? This is fantastic! I’ve made it three times already and shared with a friend who has also made it. Yum! Could this be made in a slow cooker?